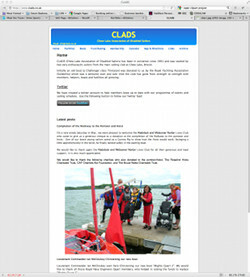 CLADS - Chew Lake Association of Disabled Sailors. CLADS (Chew Lake Association of Disabled Sailors) has been in existence since 1991 and was started by two very enthusiastic sailors from the main sailing club at Chew Lake, Bristol. For CLADS BitSolver Limited hosts a WordPress website where we have created a simple custom theme, as very few updates to the site are required. Any article or post updates are performed by BitSolver Limited. We have developed a bespoke plugin for displaying a simple event calendar, events are grayed out once they expire. Event details are stored in a simple database table. Any events that have to be canceled can be clearly marked id red. The plugin will only show events from the 1st of January of the current year. BitSolver Limited manages a free edition, no longer available to new customers, of Google for Work. This provides a cloud based corporate email and collaborating system which is simple and easy to use, and is ideal for clubs and small businesses. Google for Work can easily accessed from desktops, smartphones, and tablets via a web interface or app. Using a cloud based service makes life much easier on committees when a new member takes over a committee role. You can simply handover the login details for that role, instead of copying software and data to the new members computer. In order to make membership renewals easier we have create scripts the runs on Google's App Engine to create renewal forms and letters which are emailed to members at the start of each season. This has made a big difference to the CLADS committee.